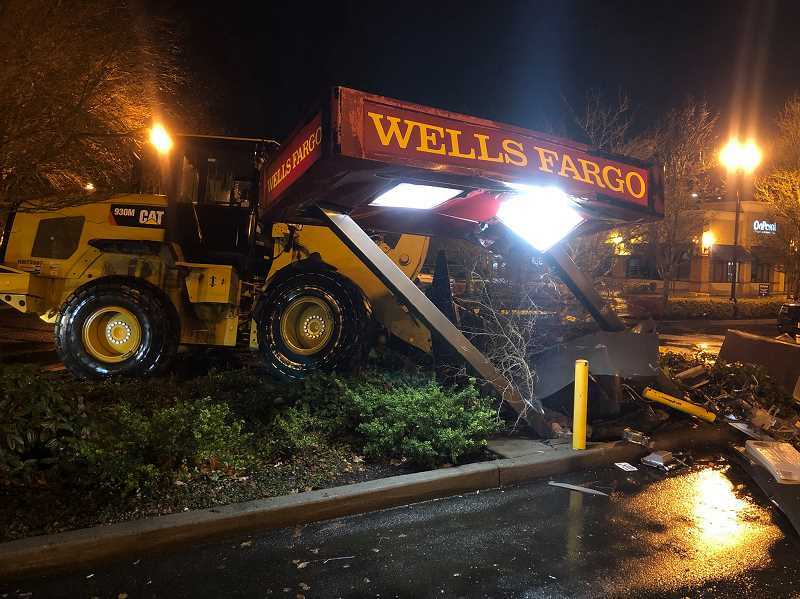 Two men drove a tractor over a Wells Fargo ATM early Tuesday morning, according to Hillsboro Police. Hillsboro Police are investigating after two people reportedly used a tractor as part of a scheme to steal money from a bank ATM early Tuesday morning. Officers were called to Wells Fargo bank, 7200 N.E. Butler St., at about 2:12 a.m., Tuesday, Jan. 8 after receiving reports of a man driving a tractor over a drive-through ATM. Eric Bunday, a spokesman with the Hillsboro Police Department, said the alleged thief drove the tractor over the ATM, destroying the machine. An accomplice, who was reportedly waiting in a U-Haul truck, then helped steal an undisclosed amount of cash from the ATM, before driving away in the van, Bunday said. The tractor, a large 930M Caterpiller Small Wheel Loader, was reportedly stolen from Robinson Construction Co., 8060 N.E. Walker Road, located a half-mile from the bank. Bunday said the thieves reportedly crashed the tractor through a fence at the facility, drove to the bank, then destroyed the ATM. The tractor was left at the scene. "This was not some run of the mill John Deere tractor," Bunday said. "This was heavy duty." Bunday said police spotted the U-Haul van driving along Northeast Cornell Road and attempted to stop it, but ended their pursuit early "for safety reasons." Bunday said the U-Haul van was traveling "exceptionally fast" and ran a red light. Officers stopped to avoid hitting passing vehicles in the intersection, Bunday said. Officers spotted the U-Haul again a few minutes later abandoned on Northeast Aloclek Drive, Bunday said. The thieves were gone. Police searched the area, but were unable to locate the two suspects. Editor's Note: This story has been updated with additional information from Hillsboro Police spokesman Eric Bunday.